So, remember a few episodes ago, when The Mando Method Podcast co-host Chuck Buda said he was toying with BookBub ads? He gives some further insight into it for his co-host, Armand Rosamilia, as well as anybody listening. Then they talk about other stuff. The Mando Method Podcast: Episode 85 - Seriously! More Mailbag?! 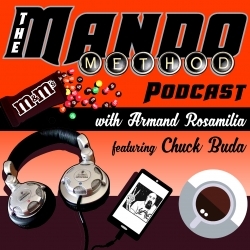 The Mando Method Podcast co-hosts Armand Rosamilia and Chuck Buda answer yet another important question from the listening audience. Did we dive into your question? Did you even bother to send them a question?